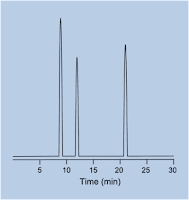 Common buffers used for RP-HPLC with pKa and UV cutoff data. 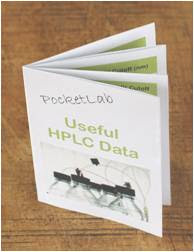 The links below open as pdf documents (available for A4 and Letter sized paper) which contains clear instructions on how to fold your PocketLab including advice on suggested printer settings. What is HPLC column efficiency? 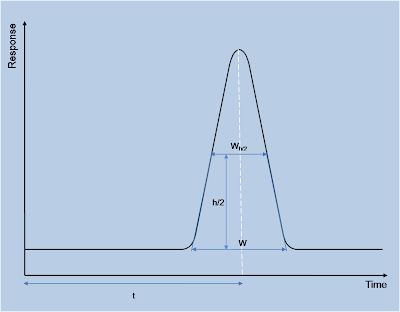 where t is the retention time of the peak of interest and W is the peak width at the base (as shown in Figure 1). The path taken by the analyte molecules through the column varies due to chance. Some molecules will travel in a fairly straight line whereas others will undergo several diversions. The effect of this is that not all the molecules will elute at the end of the column at exactly the same time. Sample molecules in a solvent will spread out without any external influence due to molecular diffusion. Analyte molecules travel from the moving mobile phase to the surface of the particle, through stagnant mobile phase in the pores to the internal surface on the packing. It interacts with the stationary phase and then is transported back to the moving mobile phase. This process is referred to as mass transfer and not all molecules will experience mass transfer in an identical way therefore band broadening will occur. The mobile phase travels in a laminar flow between the stationary phase particles, the flow being faster in the centre than near a particle. Thus some molecules travel more quickly than others. This flow distribution is reduced by ensuring that the particles in the packing have a narrow particle size distribution. The tubing in the HPLC instrumentation contributes to band broadening, this is known as the extra-column effect. HPLC columns which contain packing of smaller particle sizes give better efficiency because the diffusion paths are shorter allowing solutes to transfer in and out of the particle more quickly and thus reducing band broadening. A typical acceptance criterion for efficiency would be > 2000. Although the value for new columns would usually be very much higher than this (values in the tens of thousands) the system suitability acceptance should be based on a value which indicates that the efficiency is no longer sufficient for the separation. These calculations only apply to isocratic separations. For gradient methods the peak width remains fairly constant throughout the run due to the changing mobile phase composition and therefore the value for N would appear to increase with retention time. A more useful measure of the column efficiency would be the peak width at half height for the analyte. Monitoring this value could provide a measure of when the column efficiency is no longer sufficient for the separation. Resolution depends indirectly on efficiency and therefore if resolution is a parameter in the system suitability test then a measure of efficiency is already included. The calculation for efficiency using the peak width at half height is common to the USP, EP and JP although the terminology and notations used are not identical. However, due to a slight difference in rounding, the constant in the equation is 5.54 in the USP and EP but is 5.55 in the JP. 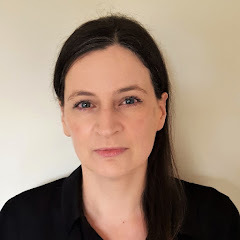 This blog post is an excerpt from 'An Introduction to HPLC for Pharmaceutical Analysis' by Oona McPolin, available to purchase through the MTS website.